At 51 years of age, my husband Rob and I shocked our friends and family when we announced we were relocating to Bali. In 2016, after selling our half-acre home, two cars and most of our belongings, we ran away from home. Don’t worry, the kids are old enough to look after themselves—in fact, they’re now the biggest supporters of our new life. We’d been visiting Bali since 2004 and like many other Australians, it was a dream of ours to live here. While holidaying here and living here are two very different things, it’s been the best move we’ve ever made. But to be honest, my husband Rob, and I haven’t totally given up working life, we have a restaurant on the beach in Sanur which we run. Our “office” views are of the turquoise waters of Semawang beach and our “working day” is around two to three hours long at most. Our rescue pup, Chillidog, has become an icon in the restaurant and I’m sure more people drop in to see him than me. 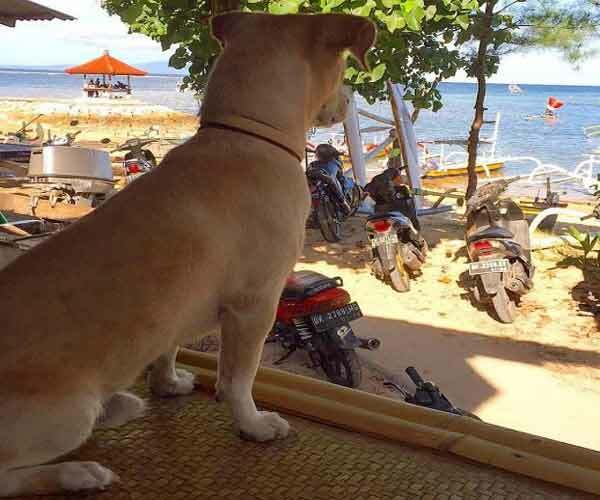 Our rescue pup Chilli loves to keep watch from our restaurant. The rest of the time we’re catching up with new-found friends or discovering and travelling to other areas in Bali and the surrounding islands. Our sights are set on exploring more of Southeast Asia and with airfares so low, why wouldn’t we? 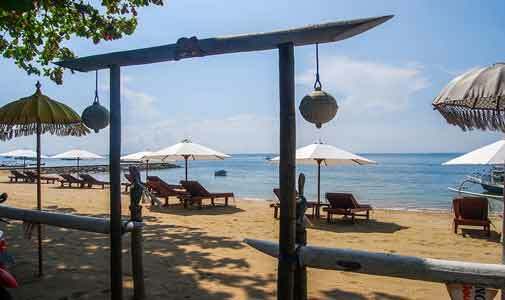 Our home is now a quaint, two-bedroom villa in the west of Sanur; it’s only a 10-minute drive from our restaurant. The swimming pool gets used often, even in the midst of winter. We rent our home for around $1,100 a month, our electricity costs are around $200 a quarter and water bills are non-existent. The one thing I do wish we had before making the move here was the opportunity to talk to people who had already relocated to Bali and to learn from their mistakes. When we got settled here—and knowing how valuable our on-the-ground know-how could be for others—I submitted a story to International Living Australia magazine about our experiences. Fast forward to 12 months later and I’m International Living’s Bali Correspondent, sharing my experiences and those of other expats who have chosen to call Bali home. If I can help make someone else’s dream come true and make the move here an easier journey for them, I’m thrilled. I’m excited to be attending my first International Living Australia conference, taking place this February in Bangkok, Thailand. (For more details, take a look here). It’s been a while since I’ve spoken in public, but I look forward to sharing our story and giving tips and advice on how to make the move as hassle-free as can be. Bali might seem a complex island to live in, but once you’ve got the inside track on the do’s and don’ts, it’s heaps easier. And once you are settled, it really is more than worth the effort. Our new life here is virtually stress-free. We have no routine to abide by. We socialise when we feel like it or relax in our home and plan our next trip. Reaching out and following your dreams truly isn’t that hard to do and I’m looking forward to helping others in search of an easy island lifestyle to follow in our footsteps.